Gosh! I can still remember the bad old days when I used to throw away all my meat bones. What a waste! Now I collect and freeze every last meat bone, I can lay my hands on. Even bringing them home from restaurants and friends homes. 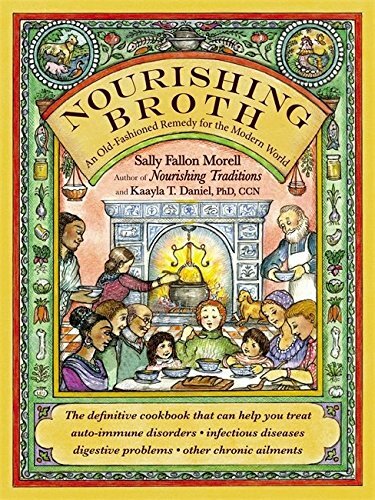 I didn’t get meat stocks and broths at all until a couple of years ago, all my attempts at making broths and stocks ended with the resulting liquid being thrown down the sink! I then saw an episode of Ina Garten’s “The Barefoot Contessa” where she made chicken broth. During the episode, Ina, emphasized the importance of tasting the broth and adding PLENTY of salt at the end. Ina almost put in a handful of salt. This was a revelation and the salt changes the broth from inedible dishwater to beautiful delicate tasting broth. 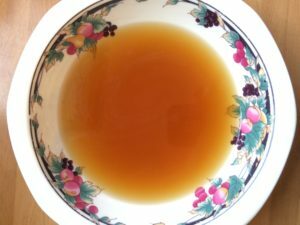 This broth is so delicious you can just drink it hot on it’s own out of a cup. To get enough bones to make up a batch, you need to either collect bones at home and freeze these until you have enough for a batch. Or speak to your local butcher, who will often give you beef or lamb bones for free, if you are a regular customer. If I get bones from the butcher I like to roast these in the oven first until brown, before using so you get a roasted flavour into the broth. Bones including a mixture of chicken carcasses, lamb bones, pork bones, beef bones, any bones except fish bones. 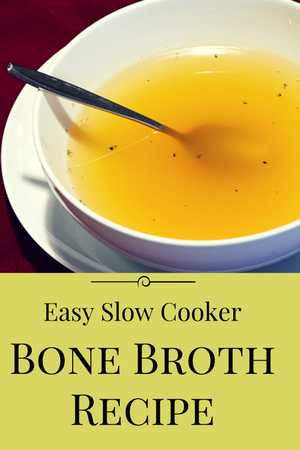 Enough bones to fill your slow cooker. If using a large stockpot the bones should only take up 3/4 of the space in the pan. Add the herbs, bay leaves and cider vinegar. Cook on low for about 24 hours in a slow cooker. If using a stockpot bring everything to a boil then simmer really gently for 12 to 18 hours, keeping an eye on the water level so it doesn’t boil dry. 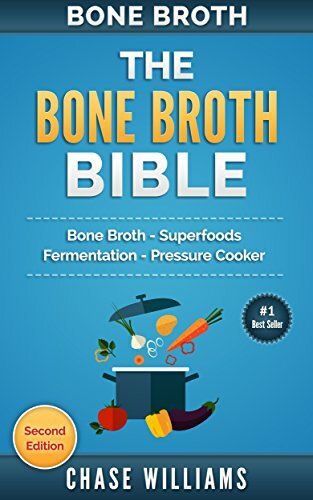 Drain the bone broth liquid.The way I do this is to use a colander, first then I strain that liquid through a fine sieve. At this point, you must taste the broth and add enough salt to make it edible. If you don’t do this the broth will just end up being thrown down the sink. You might have to put in much more salt than you would imagine. Cool and store in the fridge. When cold remove the layer of fat. 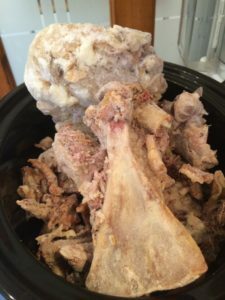 Below is a picture of the bones after I had tipped them into the slow cooker. I put the bones in while they are frozen, that is why the bones are sticking out over the top of the slow cooker. Once everything heats up the bones sink down into the water. If you do it this way it’s important that you don’t put to much water in to begin with as the water level will rise as the bones sink into the liquid. Then place all the bones back into the slow cooker add more dried herbs and bay leaves and cider vinegar. Cook again for 24 hours. Drain, sieve and skim off fat as before. As you can see the final result of simmering all those bones, sieving and removing the fat is a lovely clear broth, that is perfect to just drink as it is or to add to other recipes. Keep in the freezer, store in small quantities to add to recipes. 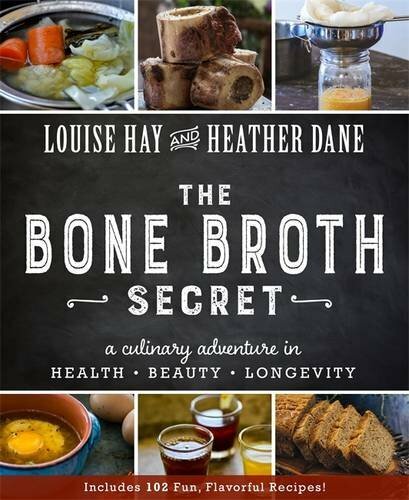 The next time I make bone broth I’m going to put the bones back for a third round of cooking since reading this article by The Farmers Wife.